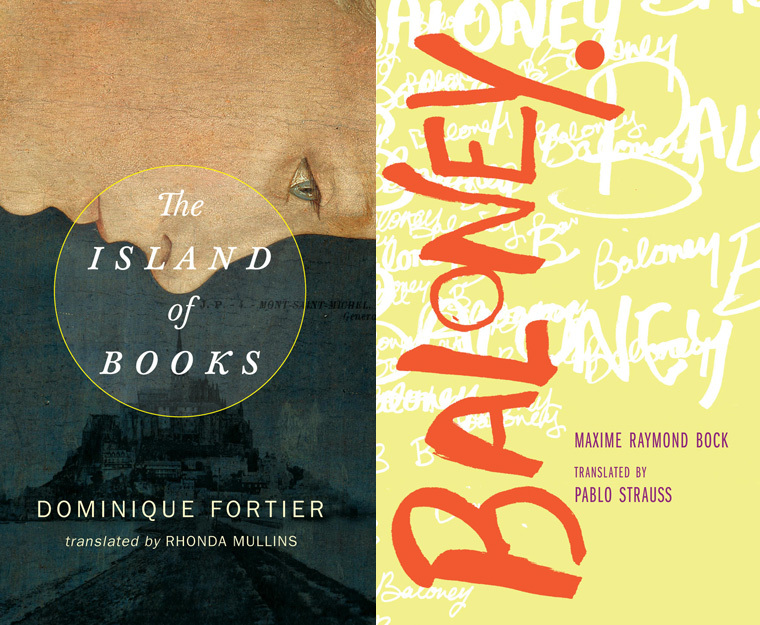 Join us and Coach House Books tonight at 7:00 pm for an evening to celebrate their launch of two new titles in translation: Baloney by the team behind Atavisms (author Maxime Bock and translator Pablo Strauss), and The Island of Books by Dominique Fortier and GG award winning translator Rhonda Mullins. Maxime Raymond Bock was born in Montreal, where he currently lives. After pursuing sports and music and studying creative writing he published Atavismes (Le Quartanier, 2011), winner of the 2012 Prix Adrienne-Choquette, awarded to the year’s outstanding short story collection. His second book was a novella, Rosemont de profil (Le Quartanier, 2013). Atavismes was released in English translation by Dalkey Archive Press in 2015. Bock works in publishing. Pablo Strauss grew up in Victoria, British Columbia and now lives in Quebec City. His translations of Quebec authors have appeared online and in print. He translated Raymond Bock's first book, Atavisms. Dominique Fortier is an editor and translator living in Outremont, Quebec. Her first novel, Good Use of Stars (2008), was nominated for a Governor General's Award. She is the author of five books, two of which have been translated into English. Rhonda Mullins is a writer and translator living in Montréal. She received the 2015 Governor General's Literary Award for Twenty-One Cardinals, her translation of Jocelyne Saucier's Les héritiers de la mine. And the Birds Rained Down, her translation of Jocelyne Saucier’s Il pleuvait des oiseaux, was a CBC Canada Reads Selection. It was also shortlisted for the Governor General’s Literary Award, as were her translations of Élise Turcotte’s Guyana and Hervé Fischer’s The Decline of the Hollywood Empire.